7. Have we resolved the smallest photospheric magnetic elements ? Authors: M. Mathioudakis, P. Crockett, D. Jess, S. Shelyag, F. Keenan, D. Christian are from Astrophysics Research Center at Queen’s University Belfast. The dominant pattern of the quiet solar photosphere is granulation, the top of the small-scale convection cells with diameters of 1,000 – 2,000 km and lifetimes of a few minutes. The granular velocity flows remove magnetic flux from the granule cells and advect it into the dark intergranular lanes. The magnetic flux clusters to form small magnetic flux concentrations, (1″ or less in size), known as magnetic bright points (MBPs), with strengths often in excess of a kilogauss . Despite the overall success of photospheric and sub-photospheric models in reproducing several of the observational properties of MBPs, we still do not fully understand the physical processes involved in this strongly magnetised photospheric plasma. Disentangling the physical parameters required for MBPs to exist will significantly advance our knowledge of the creation and evolution of these small-scale kilogauss features. This nugget compares new high spatial resolution observations with numerical simulations placing emphasis on the size of MBPs. The increased MBP brightness in G-band (4305 A) images, is due to an evacuated flux tube and the depletion of the CH molecule in these structures. The reduced density places optical depth unity inside the tube at a deeper geometrical depth where the temperature is higher. The significant weakening of the CH absorption lines in these structures, due to the dissociation of CH at the increased temperatures, make MBPs bright in the G-band . We have used the newly commissioned Rapid Oscillations in the Solar Atmosphere (ROSA) instrument at the Dunn Solar Telescope, to obtain diffraction limited images of the quiet photosphere in the G-band with a resolution of 0.12” (0.069”/pixel) . We have also carried out simulations of radiative magneto-convection in the upper convection zone and photosphere. The computational domain used in the simulations is 12 x 12 x 1.4 Mm3, resolved by 480 x 480 x 100 grid cells, providing a resolution of 25 km per grid cell . The simulations compute the LTE spectrum in the 4295 – 4315 A range, which consists of 328 absorption lines, 239 of which are produced by CH molecules. An average magnetic field is also inserted in the computational box. This setup allows us to compute the radiative diagnostics in the G-band and compare them with observations. Observed and simulated G-band images, with several MBPs visible, are shown in Fig 1. Our study includes a series of 500 ROSA G-band images incorporating approximately 63,000 MBPs. Each MBP was identified and had its area measured. The observed area distribution of MBPs is shown in Fig 2. Figure 2: The observed area distribution of MBPs (black). 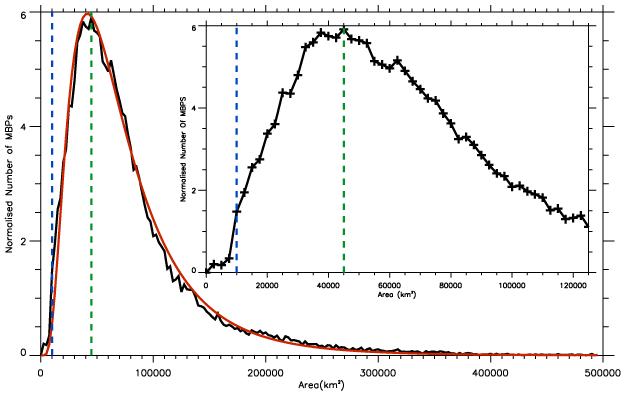 The peak of the distribution at 45,000 km2 and telescope diffraction limit at 10,000 km2 are shown as green and blue dashed lines respectively. A log-normal fit to the distribution is overplotted (red). The peak of the distribution occurs at an area of 45,000 km2. Assuming a circular geometry this corresponds to a diameter of 230 km. We introduce different magnetic flux densities (100 G, 200 G, and 300 G) in the simulations, and generate a series of G-band snapshots. We then apply the same MBP identification and area estimate process as for the observations. The output is shown in Fig 3. 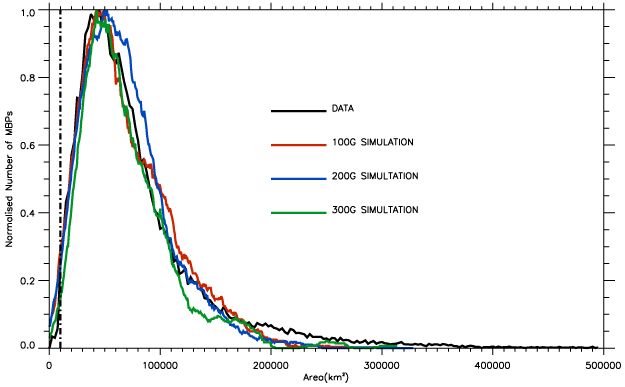 Each of the three simulations, based on different magnetic flux densities, agrees with the observations. They all peak at approximately 45,000 – 50,000 km2 and show the sharp decline to the diffraction limit. Figure 3: The observed MBP area distribution compared with simulated distributions derived for average magnetic filed of 100 G, 200 G and 300 G.
The area/size distribution of photospheric magnetic bright points peaks at approximately 45,000 km2 which is significantly higher than the telescope diffraction limit. The peak of the distribution in Figs 2,3 corresponds to the most probable width of the inter-granular lanes. This observational finding agrees with simulations of radiative magneto-convection. The simulations also reveal that the area distribution is independent of the magnetic flux density. The size of the smallest MBPs, is defined by the width of the inter-granular lanes, which is subsequently limited by the radiative and convective energy balance and mass conservation in the magneto-convection process. Large MBPs, with widths in excess of 500 km, will find it difficult to form due to insufficient radiative heating through the walls of the flux tubes. Our results suggest that we are currently resolving the vast majority of the MBPs in the quiet solar photosphere. Observations at higher spatial resolution will allow us to resolve the fine structure of MBPs and the physical processes occurring within. A detailed description of the work presented in this nugget may be found in  and the PhD thesis of Philip Crockett.